What Everyone Ought To Know About JCBL POLICE MORCHA? 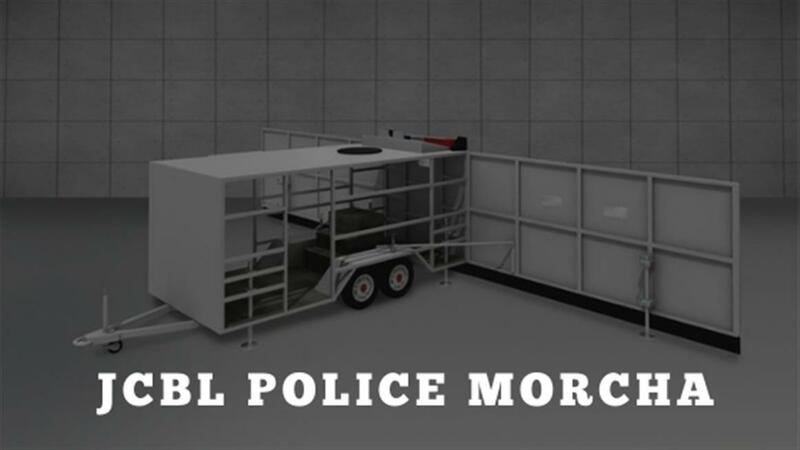 Mobile Ballistic Barrier in India is not entirely a new concept. We had a fair share of traditional barricades made in the past. Times have changed and so have the perils of modern age. Today, a grave or a serious situation can pop up just like that. This has made disaster or risk management mandatory. No life should be at risk. Here is what you need to know everything about JCBL Police Morcha. We all look for great features in any new product when it’s launched. What attracts us the most is the product’s usability quotient. Nobody wants a shoddy product. JCBL armouring solutions have kept this in mind. In the ancient military arena, it was mandatory to guard your posts in a battle. Self-defense was taught in the form of martial arts and external defense mechanism. JCBL thus, has incorporated internal lights and fans for making it more human friendly. No one likes to stay in a box and hence the required addition. It also has an external safety light on its body. This is meant for making visibility better in foggy/unclear situations. It comes with an electronic displayboard to get a better view of what’s happening outside. Two CCTV cameras pre-installed with one extra pan-tilt-zoom camera makes it all the more worthy in security parameters. These come with DVR and 1TB disk space, to accommodate large data size. Storing and analysing information becomes much easier with this. This helps in critical situations a lot. It also comes with 3 Jockey Wheels and 10 landing legs to make it portable and easy to transport. This eliminates the tardy and static nature of traditional barricades. Asa mobile safety barrier manufacturing company, JCBL stands for quality, innovation and strength. To combat visibility and energy issues, 2 halogen lights and two charging sockets are also an in-built part of this wonderful solution. In this way night time mishaps and ambush attacks can also be tackled beforehand. A 3KVA genset and roof hatch makes it equally efficient. This not only makes it smart but helpful too. With such stunning features, there is no issue of power exhaust or inadequate sheltering. In the fortified city of Jodhpur, the ‘Merti Gate’ had a spare front wall to prevent direct attacks. This gave an edge over the enemies who couldn’t get access to the city. Windows for viewing on either side of the barricade qualify as a similar example. A 6 peek window makes guarding and watching easier. It has a teeth strip for base protection, meaning no one can enter it that easy. It is also difficult for a trespasser to act or make threats. Elevated platform with apt sitting arrangement adds to its usability. Human friendly frame coupler with hitch ball makes hauling/towing all the more easy. It’s compatible with TATA 407 and Innova alike. Width and height stands at 2.3 m and 2.53 m respectively. With a total length of 6.15 m, it is much more convenient than traditional barricades. Spanning doors when deployed for an emergency purpose covers 12m in total area covered. These can be joined and folded making it easier to use. Overall, it makes this product a feather in the cap for JCBL shining as an innovative bulletproof road barricade manufacturer. Chandragupta Maurya is said to have one of the best armies in the world. Defense was as strong as the army. The great military theorist Carl Von Clausewitz held the opinion - “Tactics is the art of using troops in a battle; strategy is the art of using battles to win the war”. In the same manner, JCBL has made it a point to provide world class secured solutions to make it a better place. Unfortunate incidents like 26/11 should not be repeated. This is not acceptable in any nation, at any cost. Also, riots and emergency situations demand such solutions to be implemented. Ergo, the production of barricades is the next step in providing security. JCBL has come up with an excellent solution displaying state-of-the-art technology. 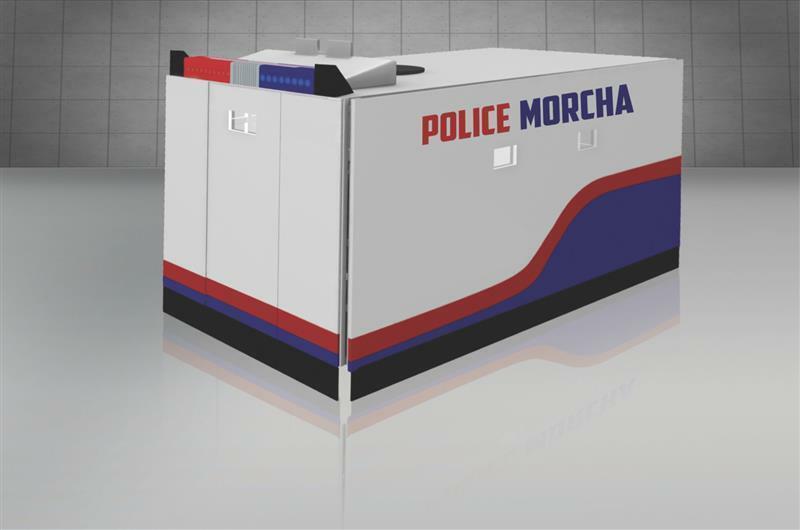 Developing and designing Police Morcha Mobile Barrier is an innovative approach towards better future security preparations. 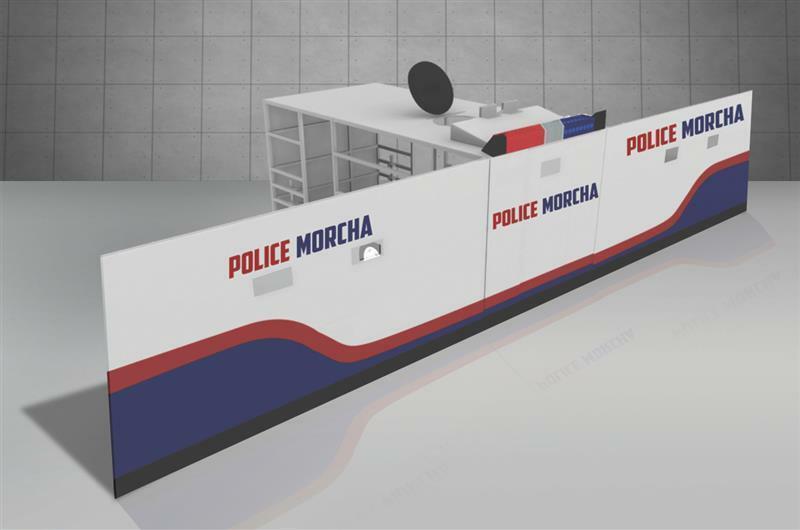 With modern day features like digital video recording, electronic display and genset to go with, armoured crowd control barricade is definitely going to be a game changer. The merit portion is its compatibility with modern day features to go with. The battery backup of 200AH makes it all the more valuable in safety and security areas. Copyright © 2019, JCBL Armouring Solutions. All Rights Reserved.